The biggest advantage of an Outdoor Wedding is the absolutely gorgeous places we go to in the Great Smoky Mountain National Park. We go to Greenbrier (Click on thumbnail Below) Cataract Falls (Click on thumbnail Picture Below.). The beauty that surrounds you makes one feel closer to God and nature. There is no dress code. We marry people in formal attire as well as blue jeans. In other words, you can have it your way! 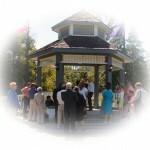 We also offer a Gazebo wedding at beautiful Patriot Park in Pigeon Forge. 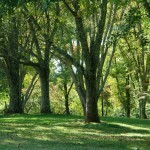 Click Below for a Picture of Patriot Park. 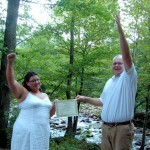 Important NEW information: Our National Park Weddings have increased due to new Park Policy requiring a permit of $50. We have increased our price by $100 due to the monetary and legal requirements placed on us to plan and perform your wedding. 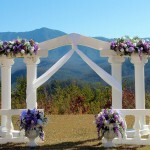 We are one of just 2 or three companies allowed to perform weddings in the National Park. We are the most affordable. Get it all with Gorgeous Lake View with the Smokey Mountains in the same scene in the midst of wooded area. This perfect for small weddings or large. Restrooms, and a Pavilion for Catered Receptions all in the same area. Park Restrictions Now Require $50 Permits (included in price). We secure a permit for you. The maximum amount of people the Park allows is 20 including minister *Additional requirements, e.g., CUA License from the Park, Insurance Increase and other stipulations and fees require us to charge the $100. 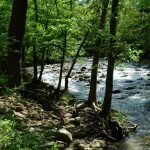 Beautiful Creekside Locations in Gatlinburg and Pigeon Forge. Examples of Garden Weddings with Beautiful Mountain and Garden Views, Highlands with the Ultimate View and Douglas Lake with Lake and Mountain Views. 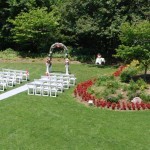 The Garden Wedding is naturally beautiful. However, arch, decorations can be added. 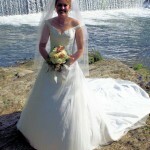 This simple ceremony is performed by an ordained minister at your cabin or outdoors by a waterfall or other romantic settings in the Great Smoky Mountains National Park. Feel free to bring your own cameras. The minister will be more than happy to take some memorable pictures for you. There are many inexpensive upgrades for this package such as heart shaped cake, wedding bouquets and your own personal web page with your digital pictures online for your friends and family to see, print or save. Upgrade Prices and Shopping Cart. 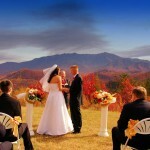 This lovely ceremony is performed by an ordained minister at your cabin or outdoors by a waterfall or other romantic settings in the Great Smoky Mountains National Park. With this package, receive 20 4×6 photographs in unique poses. Included is a beautiful 6-inch heart shaped wedding cake. A bottle of nonalcoholic champagne and 2 glasses are provided for a toast. There are many inexpensive upgrades for this package including wedding bouquets, additional pictures, limousine service and even a romantic carriage ride following the ceremony. Upgrade Prices and Shopping Cart. 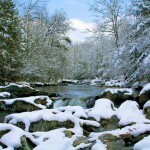 This celebratory service is performed by an ordained minister at your cabin or outdoors by a waterfall or other romantic settings in the Great Smoky Mountains National Park. Included are 30 4X6 photographs with 30 unique poses. These pictures are taken by our experienced in house photographers with state megapixel Sony Cameras. A Silk flower bouquet and 3 boutonnieres are included with two additional maids of honor bouquets or and a garter. Also, enjoy a 10″ cake. A bottle of non-alcoholic champagne and 2 glasses are provided for a toast. There are many inexpensive upgrades for this package including, additional pictures, two and three-tier cakes, catered finger food or full catered receptions, limousine service and even a romantic carriage ride following the ceremony. Upgrade Prices and Shopping Cart. 1. Minister Comes to your location, performs the ceremony, fills out a license and files it with the courthouse. 2. Thirty 4 X 6 Pictures with 30 unique poses. These pictures are taken by our experienced in house photographers with state megapixel Sony Cameras. The first thing you need to do is fill out our form below. No payment is required to fill out our form. We will contact you either by email or telephone and let you know the availability of the date and time. After confirmation of the time and date you requested, you will need to make full payment. We offer the convenient and secure payment by Check Card, Credit Card or Check through PayPal. If you prefer, we can take your payment by phone. *We operate through a “first come, first serve” basis. Your time and date are not assured until we receive payment.